Thanks to Astragal Press, we have a classic back in print. Introductory presentations cover iron's general properties as well as basic forges, squirrel cages, anvils and tools prior to a series of practical exercises on both basic blacksmithing and forge welding, which includes gas welding advances that were in existence at the time. 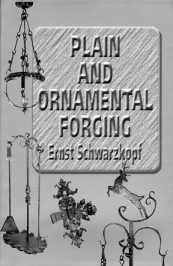 Included is a presentation of forging exercises. Other presentations include the property of steel. This includes the Bessemer Process, which currently blacksmith Bob Heath and others are attempting to replicate at Tannehill State Park in Alabama. Tempering, annealing and hardening are processes covered, along with a basic chart to indicate the suggested colors that occur when we make tools, such as heat-treated and hardened chisels. Several black-and-white photographs show samples of the forger's art, such as hardware, leafwork or the production of tinsmithing tools. No book of this period would be complete without the inclusion of period art forging, which other authors have called art metalwork. Such artisans concentrated on the production of both scrolls and fancy metalwork, which we now call ornamental ironwork. The advantage to having this book on hand is that it presents tips on how to product such creations. Rounding out the book is an index, as well as suggestions on working with brass and copper pipes and the creation of flowers.